Begin searching for a toll free vanity number by typing any combination of letters and numbers. We suggest you set your prefix to 8** to get the largest set of results, returning a mixture of vanity number using 833, 844, 855, 866, 877, and 888 toll free prefixes. 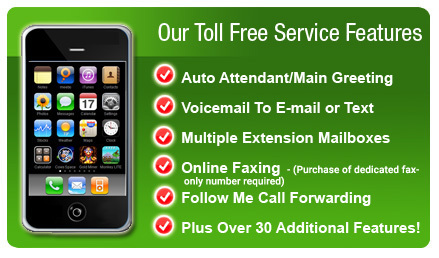 We reserve our toll free numbers from the National Toll Free Database used by all providers to ensure you are receiving real-time availability. Each vanity number search will return eight results. To obtain additional options click on the Generate More Numbers button below the results until you find the number you desire or perform a new search if you aren’t finding any matches you want to use. Wildcard options displayed as 8** will generate a mixture of Toll Free numbers using the prefixes 833, 844, 855, 866, 877 or 888. You can also use the wildcard "*" within your searches too. For example, is you search for 'CASH***'. Your search will return all available numbers with the first four numbers spelling out the word 'CASH' (2274) and will add 3 randomly generated numbers where you have a "*". on a weekly basis. Usage that exceeds 5000 minutes over a 30 day period will be billed at 4.90 cents per minute.